The New Eagle Auction Committee has been working tirelessly to put on our very best auction ever! The New Eagle Online Auction will be held February 5-11, 2019. This year the auction is entirely online — only the classroom art projects will be auctioned live at the Parent Social on February 22. All other items will be published and auctioned right here on the New Eagle website. 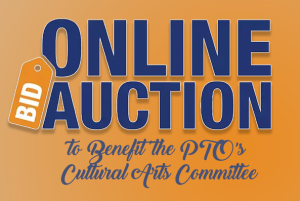 The Online Auction benefits the PTO’s Cultural Arts Committee, which relies on money raised from this fundraiser to provide engaging and inspiring arts opportunities for our children. We encourage all families to register ahead of time and participate in the fun and excitement of bidding starting February 5! For complete information about the auction, including information about registering for an account on the New Eagle PTO website, visit the New Eagle Online Auction page.